I decided to try this out and let everyone see what I've been up to. So here goes. Since Toni has a spot that she puts pictures of Annie and Benjamin on it has been great for me tokeep up with them and watch them grow. I have really loved seeing how much they change. I thought I would put some pictures of Marshall (Carly's little boy) out there. Here's one from Christmas - he wasn't very happy. How about a picture of my latest quilt. 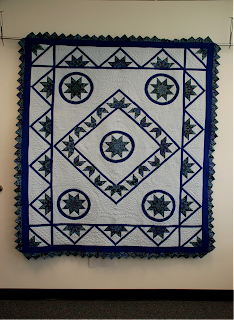 You can't see any of the details - that's what makes it such a good quilt.